Become a partner and get two gifts at once! From 8th to 22nd of October become a partner of "FreshForex" and get two gifts at once: a website and an active assistance in its promotion! Year by year the number of partners of "FreshForex" has been growing and, to celebrate our jubilee, we decided to make a present to all new participants of our affiliate program. Now it is even easier to start earning with a reliable broker! Just open a partner account within the period of the promotion, verify your personal data and send us a request with the subject “Website as a gift”. Each participant of the promo receives not only a ready-to-go partner's website, but an assistance in its promotion as well. 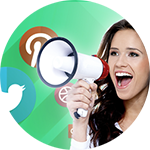 A referral link to the website will be published in all active social networks of "FreshForex". Have already become a partner of "FreshForex" but have not received a partner's website yet? You also can take part in this promo! On our website you will find detailed terms of the “Lucky partnership” promotion. Participate and get useful gifts! Stay in trend - read ForEXpress! Fresh Forex news - a new feature of your terminal!